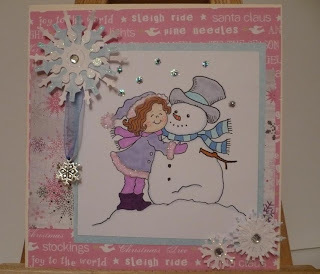 Wow week 3 already.... hello, Carol here... it's my turn to set the challenge this week for Crafty Catz, but before i let you know what it is i would just like to say Thank you for joining us last week and what fantastic cards, wow and those Butterflies, We loved popping to your blogs and having a sneaky peek, hope you all continue to join in the fun. Kirsty will announce the winner and top 5 on a later post. Heidi is our sponsor this week at Simon Says Stamp, Heidi is offering a $10 gift voucher for her store and will also pay the shipping fees. 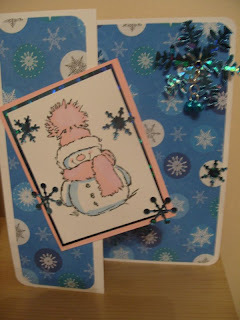 The DT have been busy with some inspiration for you, thats if you need any,lol ...please pop over to their blogs to find out more details about their cards. 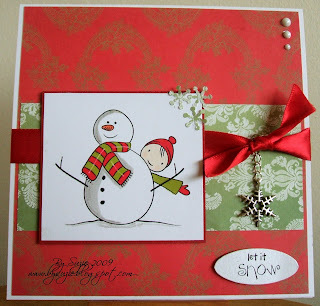 Snowmen and snowflakes - what a groovy challenge; my favorite kind of Christmas. That was my favorite theme for that holiday - snowmen. The DT did a fabulous job creating lovely artistic samples to help get us inspired! I'll post my creation in a bit. Hi - Just found your lovely blog tonight so I have entered my card which I made a couple of weeks ago, as it just seemed to fit the bill! Great theme! Gave me a chance to use my new stamps!! Hope its ok that its not a card. Think I will make a card to match it though as it is a gift. Fantastic cards this week DT! 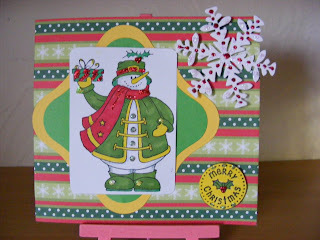 I love snowmen, thanks for inspiration!! Just discovered this site....what fun! And the inspiration to begin those Christmas cards!